How to be a pastry chef? By now, you guys should be aware that to me, Dan Lepard is to bread-making what Pierre Hermé is to pastry. My icon and absolute role model. I never really used to make bread, except for the occasional pizza dough; but since I’ve discovered Dan’s take on bread making I’ve literally been unstoppable. Fresh yeast has become a staple in my fridge and I’m known to run to the grocery store as soon as my flour stock approaches 2kg. So far, I had only made white loafs or buns; to which I regularly added ingredients such as herb butter, cheese or mashed potatoes. However, I needed a focaccia for the Christmas Eve dinner my sister and I were hosting. And while I firstly intended to make my reliable pizza dough, only slightly wetter; I quickly moved on Dan’s recipe. And boy, I’m glad I did! This focaccia is the best flat bread I’ve ever had and it’s a delight to make. Still, the whole process can seem a little daunting because of the different steps and resting times. Given that I really want you to make this focaccia and bite into a crusty yet moist square of this fragrant bread, I thought it would be great if we made some together. Get your aprons ready! Again, the mise-en-place is fundamental and will make you save precious time. Here, we’ll make a ferment then add water, oil, flour and salt. Mix together the ingredients for the ferment in a large bowl. Cover the bowl with a cloth and leave at warm room temperature for 2 hours, giving the mixture a good stir after the first hour. After the resting time, the mixture should be all bubbly and have doubled in size. Whisk in the water and oil. Then mix in the flour and salt with a spoon, until roughly combined. Cover the bowl and allow to rest for 10 minutes. Rub your hands, the work surface and the dough with some oil and scrape the dough onto the work surface. Work the dough by gently stretching it with your right hand, keeping it in place with your left thumb. Then fold and rotate the dough. Repeat this kneading about 10 times, but make sure to stop before it starts sticking to the work surface. Knead again twice at 10-minute intervals. The dough will change from lumpy to smooth and elastic. Cover with a cloth and leave to rest for 40 minutes. It’s now time to do some serious stretching and folding. This will stretch and elongate the upcoming bubbles making for big and uneven holes in the final bread. Stretch the dough into a rectangle then fold it into thirds first in one direction then the other. Repeat this twice with 40-minute intervals. Once you’ve stretched-folded three times, allow the dough to rest for 30 minutes before going on with the shaping. Rub a baking tray with olive oil and place the dough onto it. Lightly flatten the dough using your fingers – it’s normal if it springs back. Cover with a cloth and leave in a warm place for 20 minutes. Preheat the oven to 220°C. Pick the corners of the dough and stretch them out until they reach the corners of the tray. Sprinkle with a little water and some oil. Bake for 15 minutes, then reduce the heat to 200°C and bake for a further 15 minutes. Cool on a wire rack. I love your step by step photographs! Tu me donnes envie de courir dans ma cuisine pour en faire une tout de suite! can you use dried yeast instead of fresh? Hi Jennifer, you can certainly substitute the fresh yeast by dried yeast. I tried the recipe using 5g (1tsp) of instant yeast and got great results. I love the step by step graphics!! Super cute AND helpful! I’ve always just used a simple pizza dough to make focaccia, but I’ll be happy to try this one out if it can give me better results. Love, love, love the photos. Hmm, Focacia looms large on my horizon now. Hi Fanny! I am so in love with your doodling on your photos! The photos themselves are gorgeous, but so much more fun with the little illustrations on top. I’m with you on Dan too… he is a master. That look soooo good….mmm. The texture looks amazing. Marvelous! Une focaccia qui est parfaite! Fantastic walkthrough, even I understand it. i love all of your step-by-step recipes! you’re such a brilliant and talented gal. and i agree, your doodles on the photos are what make the whole thing even better! how do you do that? is it the type of computer you use? Your focaccia is perfect… “alveolatura” perfetta. I made this recipe for focaccia yesterday afternoon with terrific results. I’ve tried to make focaccia using different recipes and each time they were nothing but disappointments; basically, they were flattened regular bread dough. This, however, was wonderful. The crumb is reminiscent of no-knead bread (but dare I say better? ), and better yet, the next day it still tastes delicious, even though the crust has softened. Thanks so much for sharing, really. I tried to make some focaccia just last week and as others have commented, the result was just flat white bread with some salt on top. Not what I was looking for at all! This might be just what I was looking for. I’ve tagged you – check it out on my blog. 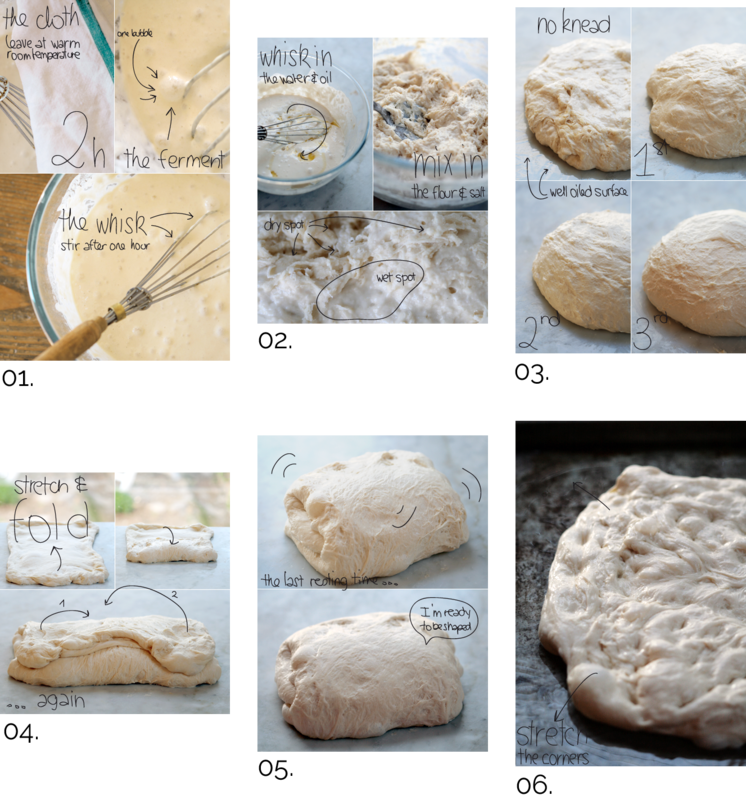 I’ve been daunted by making bread but this step by step guide is excellent! I will be making this as soon as possible. Happy new year! That’s really beautiful bread! I love making pizza dough, but never have tried foccacia. I know it’s NOT the same thing, though I’ve seen a lot of recipe say to just stretch out your pizza dough. I think all the resting times in this recipe must be worth it…it’s not difficult at all. I’ve got to find some 00 flour so I can try it. Hi Julie, this recipe so is worth it. Beyond words, beyond anything actually. Anyway, regarding the flour, you don’t have to use tipo 00 flour. I tried with both 00 and 45 and didn’t spot much difference. Type 45 flour is a French type of flour in which the wheat grains are super finely ground; so I guess, that if you can put your hands onto some superfine flour, it’ll make the trick. I love your fotos, and the step by step instructions – perfect! I absolutely LOVE your pictures! Lovely, your step by step is absolutely perfect as usual! make bread is my passion and Dan Lepard is a Genius..so, even if I’m so proud of my focaccia I’ll try as soon as possible his recipe (you are always so convincing Fanny :). Kisses. I just love a good focaccia and though I enjoyed the daring baker potato bread version, I want to cut my teeth on another. This looks and sounds wonderful – thanks for the step-by-step! Oh i so love focaccia. This looks absolutely magnificent. love the step by step instructions…how do we find fresh yeast. i am in the us. merci. Hi Elaine, if finding fresh yeast is a problem for you, you can always use a teaspoon of active dry yeast instead. Those are some seriously cool photo edits to illustrate the process. Kudos. fanny!! Delicious..it’s a perfect italian focaccia!Yum..
What a cool, fun tutorial. Your bread looks really yummy. I am from the States, and was wondering if I can use all purpose flour and active dry yeast? If anyone from the states knows, please let me know, thanks. You can certainly use active dry yeast. 1tsp should be enough. Regarding the flour, try to get as close as tipo 00 flour by using superfine all purpose flour. If unavailable, all purpose flour should work almost equally well. What a flirty girl you are 😉 By the way, your comment totally made me splurge one Jeffrey’s book. Can’t wait to get it. I love all the notations you put on your photos. 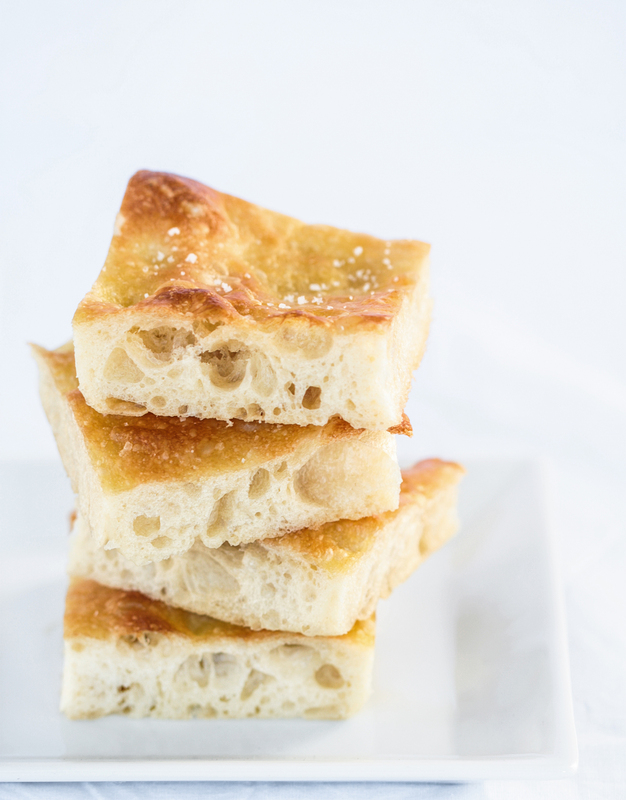 Focaccia is a favorite of mine and this looks like a terrific recipe. Wonderful post — great photos and step-by-step instructions. Thank you. I need to come here and hang out more often…you make it look so DARN easy. J’adore ton billet avec la marche à suivre illustrée c’est très clair! Wow… your blog is fantastic!!! and I’m doing the second tray right now as for the first suddenly disappeared. Thanks for sharin this recipe. Thank You for sharing this recipe and really terrific your picture and the grafic: what a beautiful idea!!!! And helpful, too!!! What a great recipe! By increasing all the 10min. resting times to 20min. and also increasing the second baking time to 20min. the results are even better! i just have to say thanks for walking me through each and every step of it, my focaccia came out beautiful! i love your paso a paso and the pictures that go with it, seriously helpful (and this isn’t the only recipe of yours that has led me through new recipes i’ve tried out). thanks again! I Just made this awesome recipe, I did add about a cup of home made black pitted olives from my parents olive grove to the dough and quite a bit of olive oil on top of it and some rock salt and it is absolutely delicious, when I lived in Italy I ate a lot of it but when I came home to New Zealand I couldn’t find the real stuff anywhere, it was just plain white bread flattened and that is not focaccia. I have tried Other recipes but they just didn’t turn out, I also used 1 teaspoon of died yeast. I took some around to my parents and they couldn’t believe i made it lol Madre was very impressed. So thank you for this great recipe that is quite versatile you have made a lot of tastebuds very happy.